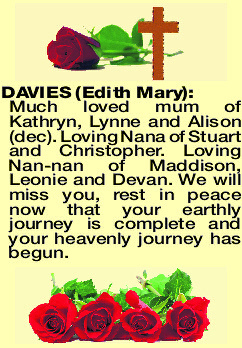 DAVIES EDITH MARY Much loved mum of Kathryn, Lynne and Alison (dec). Loving Nana of Stuart and Christopher. Loving Nan-nan of Maddison, Leonie and Devan. We will miss you, rest in peace now that your earthly journey is complete and your heavenly journey has begun.